If you read last week’s blog post (and why wouldn’t you have?) you will remember that I covered why sometimes a SharePoint Online admin gets a face full of “Access Denied” when trying to create a new site collection. In short, it happens because of an integration failure between the time-tested SharePoint Online site collection URL structure and the scrappy young Microsoft Teams site URL structure. This creates problems for you SPO admins for numerous reasons. Microsoft Teams site Owners: They are Everyone and They are No One. The Goals:To know how many of these blasted Teams sites exist, who the heck they belong to and, most importantly, to reclaim their URLs! There are two MS Teams sites named ‘HR’ and ‘Security’. Neither of these appear in my SPO admin panel. Behold! A literal plurality of Teams sites! So you have a list of all the Teams sites in your tenant. But with the value of the Owner property blank, how do we know who to yell at for making them in the first place? The first time I hit this particular obstacle I wasn’t sure what to do. I tried leveraging Select-Object or adding the -Detailed switch to Get-SPOSite, but no matter what I did the value of Owner was always blank. I Google’d the heck out of it and got nowhere. Eventually though, those two summers I spent at Batman Detective Camp paid off big time. It occurred to me that what I needed to do is re-run the Get-SPOSite command against a single URL. Since I already had all the MS Teams sites stored in the $msTeams variable, I used that and pulled the “Url” property from the first item in the array. In this case, that was the /security Teams site. The results were still not pointing to a person to blame, but at least the value of Owner was no longer empty. Bingo! Wait…what? The value of Owner appears to be a GUID of some kind. I know enough about GUIDs to know that they generally do not end with “_o”. I think that is telling me this “Owner” isn’t a person but an Office 365 group. But that can’t be right? I mean, how can a group be the “Owner” of a site? Doesn’t it have to be a user account? Has the whole world gone crazy? Then I had whatever the SharePoint admin version of an epiphany is called. A SharePiphany? I don’t know. Anyway, I figured that if this was indeed a Office 365 group then it should be in the Azure AD database somewhere. The way to query that was my old friend MSOnline. Yes, I know MSOnline is being replaced with a more inclusive module, but that’s what I used so we are going with it. I trimmed the ‘_o’ from the GUID and saved it to a new variable $guid. Then I used the MSOnline PowerShell module and queried the GUID. WHOA. It’s a madhouse! A madhouse!! Not only is the “Owner” of the MS Teams site a group, it’s distribution group (apparently). But wait, if there’s a group of any kind that means that someone or something is in there. Only one way to find out I guess. After saving the group’s ObjectID to $id, I hold my breath. User name withheld pending notification of next of kin. Huzzah! There it is! The current Owner of this specific Microsoft Teams site is [redacted]. And it only took two PowerShell modules and a 5 bizarre steps to find this information for one MS Teams site. Oh, and don’t forget that there can be multiple Owners. The default Owner is whoever created the site but they can promote invited Members to Owner status, who can in turn invite and promote more people, and so on. In my (completely unproven) analysis, the first name on the list is the person you should talk to. So let’s say you did just that. You talked with [redacted] and found them to be appropriately contrite. They clearly meant no harm. That’s nice, but it doesn’t really help you because you have Prudence pushing you to get her new Cybersecurity site up and running. But, despite any contrition by [redacted], you still cannot access the needed MS Teams site. They could make you an Owner but then, how do you delete the site and free up that URL for legitimate business use? As soon as you set yourself (or whomever) as the Owner, access to the site is possible via the browser like any other site. If you want you can log in and snoop around. The existing Owners don’t get dumped so they can still access the site as well. But if your goal is to reclaim the URL, the site has to be deleted. Warning: You should only do this if you need to delete the Teams site to reclaim the URL. Overriding the default ownership on an existing MS Teams site, while very satisfying, will break its connection to the underlying Office 365 group. That means the site may no longer function as a user would expect a MS Teams site to function. I can’t say exactly how but, look just don’t do it unless you have to. People really like these Teams site things and there’s nothing to gain by needlessly breaking hearts. 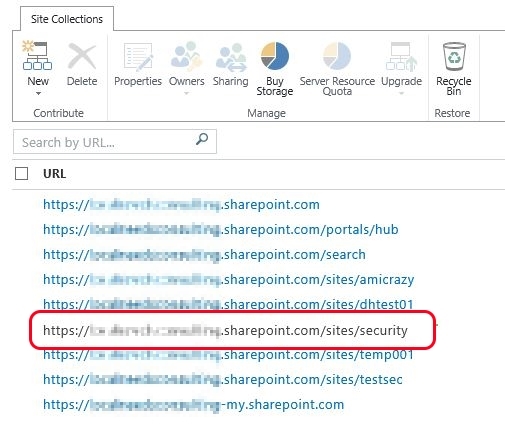 You should be able to go back to your SharePoint Online admin panel and create a new site collection with “…/sites/security” as you were (trying) to do in the first place. And there you have it. You can find your MS Teams sites, find their Owners (scolding as needed), and handily obliterate them with extreme prejudice grace and tact. Next week: What a bad person can do with a MS Team site and a hijacked URL.